I’d love to give you ten minutes of encouragement on how you can be a worry-free mom. And if you don’t have kids, I’m sure it will help you with other areas of your life that you worry about. I’m posting for you today a quick-moving, 10-minute interview of mine with Rick Probst and Dan Ratcliffe at Faith Talk LIVE Radio. 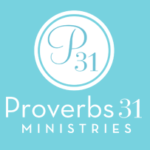 To hear a few secrets and a few amazing stories of what God does for those who trust Him with their worries, click HERE. And then….leave me a comment — or question — and you’ll be entered into another drawing for a free copy of my newest book, 10 Secrets to Becoming a Worry-Free Mom (U.S. residents only, please). on 10 Minutes to a Worry-Free Morning – Listen to This Interview. Our kids are adults and I still worry ! I’m praying, but often in the night I wake up and can’t get back to sleep because of worry about their lives. Two of our grown children aren’t walking with the Lord. Our family has a lot of problems, and my goal is to see each problem resolved, by God’s power. I’m wanting to walk in the peace and joy of the Lord. Right now, that’s difficult. Thank you for your posts. I just found you, and God is using you in my life already. Your message about knowing whether to go thru an open door confirmed God’s will for me. He wants me to wait and trust, for now. Your book would help. God bless you, I pray. Finding your website was just right as I am finding myself as a widow having to be strong g for a son who has lost his wife to alcohol ,half his home ,his job and his car .My heart aches and he needs his father .His heavenly father seems a long way off . Monica: Thank you for leaving a comment. I’m glad you found my site. 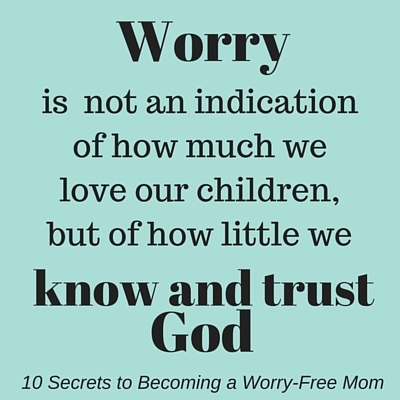 I have a chapter in my new book, 10 Secrets to Becoming a Worry Free Mom, in which I talk about God’s ability to filter out the garbage from our kids’ lives and fill in the gaps with what we believe they need but don’t have. I know that as you reach out to your Heavenly Father He won’t seem so far away from you or your son. And He can fill in the gaps with what your son is not getting from an earthly father right now. You are in my prayers today. I really enjoyed listening to this – I saw myself as that worrying parent. My kids are grown and I still worry about them. Like you said, I should stand back and let God take care of it. So hard to do! Thank you so much for your wisdom! And for the opportunity to win! Great interview!